This is a simple-enough dish, perfect for those cooler evenings we’ve been having. I was able to multiply this by a lot, to serve fifty or so, for a small wedding the deli catered at one point. Because- it is simple enough, but is also colorful (appetizing) and delicious (so folks eat it up!). Mom typically dredged the chicken in flour before cooking, but the method below makes this dish gluten-free (if you skip the optional pasta). But still delicious! 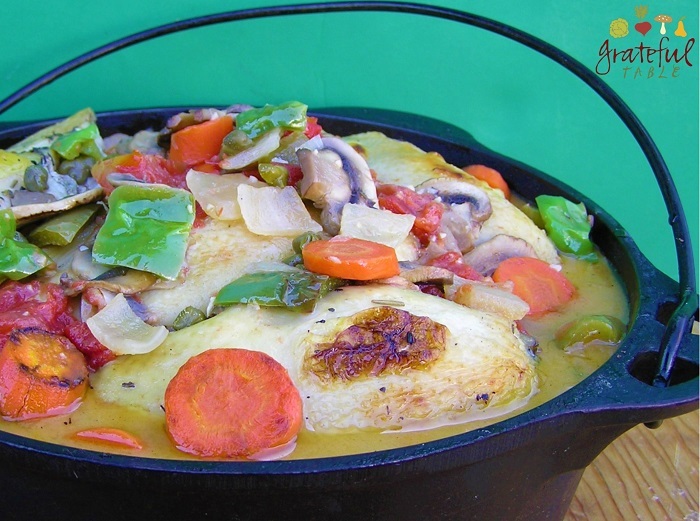 “Cacciatore” literally means “Hunter”. And while there have been a few hunters in the family, most of my hunting will be in the grocery aisle! When using boneless, skinless chicken thighs, a brine makes it extra tasty, although the traditional method of using the whole chicken (bones and all) will yield a most flavorful dish. What a comfort food! Serves 6-8. Refrigerate chicken in the brine overnight. To prepare dish, pour off brine and bake chicken in 350 degree oven for 40 minutes, until done. For tastiest, sweetest veggies, add a few tablespoons of water to the pan while they cook, which will eventually evaporate, but which will help them to cook in the meantime. Add salt if necessary. Serve over pasta if desired.